I’m surprised I haven’t written this recipe before now. This is one of the first dishes that I prepared and is a family favorite. We eat this when cash is running a little low, we eat it when we’re in the mood for it and we also make this when we have guest coming over. Almost always a crowd pleasure. I haven’t really modified it much over the years, mostly, I just add chopped onion once you add the chicken. We also had some left over green onion, so I chopped some of those and put them on top, I don’t think it added anything. I cooked it on High for three hours and we were hungry so it only cooked for two hours and 45 minutes, probably could have started eating at the two hour and thirty minute mark. I also used a full cup of milk, as I don’t have a 3/4 measuring cup, or I didn’t think I did. I didn’t fill it up to the rim so it was probably more like a 7/8 cup of milk. We buy the pre-mixed Colby cheese and Monterey Jack Pepper cheese mix so that saves a step in the preparation. The way I do it, I spend like 20 minutes (or it feels that way) on putting in the ingredients. I could have cut the bacon into smaller parts, as we didn’t buy the Oscar Meyer bacon bits, like I prefer. So there were some strips of bacon that were longer than usual. Which was nice as the bacon usually disappears in the pot. I didn’t notice a difference in taste. Sometimes, I do forget to buy an onion which I think makes the chicken taste sweeter. I did use an heavier hand when the pepper, so that made a difference too. 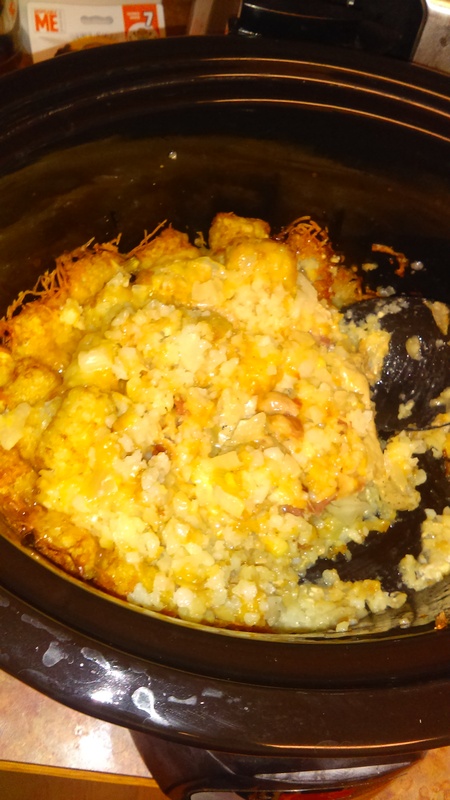 For once, the top layer of tater tots covered the top, usually I get a good circle around the border but then the middle isn’t covered in tater tots. Overall, it tasted as good as it ever does, which is pretty good. Television wise, I finally got to watch Doctor Who Season Nine’s Woman Who Lived. Pretty good episode, I really need to watch these two parters closer to each other. I’ll be heading to Denver this week, for work, so I should have plenty of time to watch my shows. So that’s pretty exciting. Except, that I finally got a working Kindle and downloaded the Teenage Mutant Ninja Turtles Legends game. I’ve tried so much to download it onto my phone but I understand why it wouldn’t work on my Android phone. It is a very large file and my phone graphics (and size) wouldn’t have been big enough for the game. There is a lot to do, and it reminds me so much of the Marvel : Avengers Alliance game that I was super addicted to on Facebook, last year. So I worry about getting as addicted to this game, which if that does happen, I’ll have to delete it and never look back. It is super fun though, I have a load of characters, I’m on mission three and trying to do all of the side stuff. I was tempted to bring my Kindle to work but opted not to do it. My mother-in-law got Walker Dennis a new Kids Kindle, so I got his old one. The battery life isn’t great but it has been hinted that Santa might get me an Adult Kindle but I’m able to do pretty much what I would have wanted on a proper Kindle, I’m just pretty much plugged into a wall the entire time though. It is a kids game, so they only give you like 60 pizza slices, which is your time meter, so that goes pretty quickly. Except, at first, it lasted as I was leveling up all the time. Which helped me get way into the game. I have a slew of characters and I feel like I’m doing okay. Now I’m at the point where I don’t have enough mutagen canisters so I can’t level up my team like I would like. Which also adds to the limitations of the game. Which I need, or I would just fall into the abyss of the game. So that happened. The game, which I might have to do a proper post on, has the same game mechanics as Avengers Alliance, where each of the five characters classes is strong against another type and weak against another type. So there is strategy to each fight. I downloaded it yesterday and I already have – Leonardo, Karai, Newtralizer (the starter characters), Snake Weed, Spider Bytz, Fishface and Stockman-Fly (got this morning). It is nice that you have five person teams, so I only have two that sit out of each fight. Our next episode of The Office is Season Four’s Dinner Party. Our next episode of Person of Interest is Season Five’s Reassortment. QSO was a pretty good episode too. We’re in the middle of Arrow Season Five’s So It Begins, we couldn’t quite finish it last night. I think that was the bulk of our television watching. I’m going to try to create a list of shows that I want to watch, while in Denver. As I do enjoy watching an episode of a series and switching to another series. It keeps it fresh but maybe I’ll just try to knock out Doctor Who, while I’m there.